How is Japan managing the disaster of this magnitude? I was given the title of this article by the Editor-in-chief of the magazine "Coordinates" but I dare to say that Japan is not yet managing the disaster but suffering from the hardships. Though all Japanese people are in mourning over the horror of this event, I feel it is my duty as an old scholar to report to the rest of the world on the worst earthquake and Tsunami in living memory to hit Japan. I hope that my report will be useful to prevent the similar misery for others. Urban object detection: a variety of objects, including buildings, roads, cars, and trees can be extracted. Participants may choose one or more object classes. 3D building reconstruction: detailed building roof models according to LoD2 of the CityGML standard are to be extracted. The working group will test submitted results against reference data. Results submitted before September 30, 2012 can be published in one or two special sessions on the benchmark at the ISPRS congress in Melbourne in September 2012. Gatewing has won the IWT award 2011The IWT (Belgian agency for Innovation by Science and Technology) distributes each year a large amount of subsidies to innovative businesses and for the second year in a row the agency organized the IWT awards. On March 17 the award ceremony took place at the Flemish Parliament and we are proud to announce that Gatewing has won the prestigious IWT award in the category of most innovative starters project. This is the third time that you receive the E-bulletin or E- newsletter. I hope you enjoy it through your reading. With this we want to draw your attention to the last month's big earthquake and Tsunami in Japan. A paper prepared by Shunji Murai, former president and Honorary Member of ISPRS has prepared an interesting report which you are going to read in this issue. These are conditions where even the most advanced EWS cannot make a big difference. So most of the potential to mitigate such a disaster in the future would have to be in the field of vulnerability reduction by adaptation, e.g. in urban planning and construction, based on risk and vulnerability maps. Another question is the quality and coordination of disaster mapping activities to support response measures. Here we have to coordinate all efforts globally as most of the disasters nowadays affect Trans boundaries. So the Geoinformation technologies will and better expressed should help in all facets of Disaster Management. An international effort in this direction is the Gi4DM series of Conferences, which was held for the first time in 2005 in Delft after the Indian Ocean Tsunami and repeated every year in almost all parts of the world. The upcoming conference in next May will demonstrate the last international advances in Geoinformation regarding the Disaster Management. Lastly we all people in the world have to learn from the Japanese Society, how they have behaved after the devastating event, silently without losing the well know manner of discipline. directly after the 32nd Asian Conference on Remote Sensing. The Summer School will continue the very successful tradition of the previous summer schools since 2005. It includes lectures, practical labs but also social events, a field trip and much fun. Apart from acquiring new knowledge in an informal environment, this is an excellent opportunity to meet lecturers and young people and strengthen your network. Jointly organized by ISPRS WG II/5, WG VII/5, ICWG IV/VIII. The workshop on Dynamic and Multi-dimensional GIS is a series of international conference being sponsored by ISPRS Working Group II/5. The objective of the workshop is to interdisciplinary forum for leading researchers in related areas to present the latest developments and applications, to discuss cutting-edge technology, to exchange research ideas and to promote international collaboration on the future directions of GIS, in particular dynamic GIS and multi-dimensional GIS. The topics of the workshop include mainly about algorithms and methods for modeling, analyzing and representing dynamic geospatial processes, as well as the quality assessment. The Mission of ISPRS Commission VIII, Working Group 2 (Health) focuses on applications of remote sensing and other Earth observing technologies to understand how the natural environment contributes to environmental (asthma, cholera, meningitis, malaria, yellow fever) and infectious/zoonotic (AIDS, TB, influenza, gastroenteritis, plague) diseases. One of the areas of interest is identifying Earth observing data that are used to improve models and to enhance surveillance systems, decision support tools, and early warning systems. To this end, Working Group 2 is proud to announce its symposium on Advances in Geospatial Technologies for Health. This 2-day event focuses on applications of geospatial technologies for human health and well-being to integrate environment with health sciences. The venue is the La Fonda Hotel located at the historic plaza in Santa Fe, NM USA. From March 2nd to 4th 2011, the 4th 3D-ARCH international workshop on "3D Virtual Reconstruction and Visualization of Complex Architectures" was held in Trento, Italy. The workshop was jointly organized by the 3D Optical Metrology (3DOM) unit of the Fondazione Bruno Kessler (FBK) Italy and the Dept. of Architecture, Carleton University, Canada. The conference chairs were Fabio Remondino (FBK) and Sabry El-Hakim (Carleton Univ.). The event was the fourth in a series, following the events in Venice 2005, Zurich 2007 and Trento 2009. The workshop was sponsored by Leica and ShapeQuest, supported by ISPRS and CIPA and held as an event of the ISPRS Working Group V/4 "Image-based and range-based 3D modeling". Although this year's Summer School (SS) under the auspices of ISPRS Student Consortium (SC) and WG VI/5 took place in autumn, its parameters had been set to pure summer and manifested in the land of conical hats – Vietnam. Given the fact that the SC is an international organization, it is consistent that its main annual event happens every year at another place of the globe and thus offers the opportunity to expand knowledge and all the benefits offered by SS to different groups of young people, in particular to local Geomatics enthusiasts. After last year's successful SS in Warsaw, the 5th SS saw the light this year in Southeast Asia, precisely in the capital city of Vietnam, Hanoi, where 54 participants gathered from 6th to 10th of November 2010. IGI mbH have approved by ISPRS council to become ISPRS Sustaining Member on 31 March, 2011. IGI mbH was founded in 1978. The primary goal of the company was to manage airborne sensor systems for flight guidance, sensor control using GNSS (Global Navigation Satellite System) and INS (Inertial Navigation System). Today the portfolio includes additional sensor systems using LiDAR, digital camera systems and thermal camera systems. The results of the 2011 election have been tallied by the American Society for Photogrammetry and Remote Sensing (ASPRS) Tellers Committee and they reported that Stephen D. DeGloria, a professor at Cornell University in Ithaca, New York, won the election to become ASPRS Vice President for 2011. With the installation of officers at the ASPRS Annual Conference in May, Gary Florence moves into the position of President; Roberta (Bobbi) Lenczowski becomes President-Elect, and Carolyn Merry becomes Past President. David Alvarez was elected Assistant Division Director of the ASPRS Geographic Information Systems Division (GISD). Allen Cook was elected Assistant Division Director of the ASPRS Primary Data Acquisition Division (PAD). The death occurred in Brisbane on 25th February, 2011 of Ian Allan Harley. Ian obtained his PhD at UCL in 1962, under professor E H Thompson and went on to become Reader and Head of Department of Surveying, University of Queensland. In 1969 he was awarded a research fellowship by the Alexander von Humboldt Foundation which enabled him to spend 12 months with Professor Ackermann at Stuttgart. In 1982 he returned to UCL to take the position of Head of Department and Professor of Photogrammetry and Surveying. He retired in 1997. He was Book Review Editor of ISPRS Highlights from 1998 – 2004. Jadwiga Zarzycki, wife of George Zarzycki from Canada passed away on Friday March 25 after a brief illness. Jadwiga regularly accompanied George when he attended ISPRS Council meetings from 1980 to 1988 and became a close friend of the Council and their partners during this period. 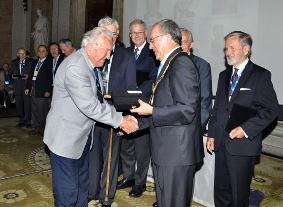 She and George attended the ISPRS Centenary Celebrations in Vienna in July 2010, during which time George was one of the 12 ISPRS Fellows elected during the Centenary General Assembly on 4 July 2010. The ISPRS family expresses its condolences to George and his family for their sad loss. 11th International Scientific & Technical Conference "From imagery to map: digital photogrammetric technologies"
7th ISPRS Student Consortium and WG VI/5 Summer School "Spatial Information Sciences for Environmental Monitoring"
28-Mar-2011: 2 Tenure track positions in Mapping and Geo-information Engineering at the Faculty of Civil & Environmental Engineering, The Technion – Israel Institute of Technology, Haifa. 8-Apr-2011: Lecturer in Land Surveying and/or Photogrammetry, School of Civil Engineering & Geosciences, Newcastle University, UK. 13-Apr-2011: Postdoctoral researcher to study the optical and benthic properties of the nearshore environment of Lake Tahoe using field spectroscopy and remote sensing, The Center for Spatial Technologies and Remote Sensing, University of California Davis, USA.